A week after he defended going to parades, rallies and events where terrorists are glorified as a way to let conversations happen, NDP Leader Jagmeet Singh disciplined an MP that dared to vote for freedom of speech and freedom of religion. David Christopherson, a long-time member of Parliament from Hamilton, was stripped of his position as Deputy Chair of the Procedure and House Affairs Committee. His sin, he voted with the Conservatives to allow the Canada Summer Jobs program to continue to give grants to groups like summer camps run by religious groups that oppose abortion. Under the Justin Trudeau values test any organization that wants a summer jobs grant must sign what the government calls an “attestation” that they support abortion. The Conservative motion was written to get broad support that groups looking after the most vulnerable were not caught up in Trudeau’s push to strip grants from activist groups working to change laws or policies on abortion. Christopherson, and Liberal MP Scott Sims, both broke ranks on the motion and although both are pro-choice in abortion said clearly that groups that hold pro-life views shouldn’t be punished by a government program. 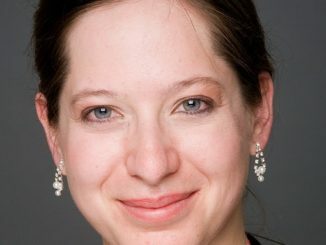 “In my view, ticking off that box was taking away a right that they have and that needs to be maintained,” Christopherson told The Hamilton Spectator. And for standing up for that right, that point of principle, Christopherson was punished by his party. Now compare this to Singh, the NDP leader who attended many events where terrorists like Talwinder Singh Parmar were honoured and held up as martyrs. Parmar was the mastermind of the Air India bombing, a terrorist act that killed 329 people including 268 Canadians. 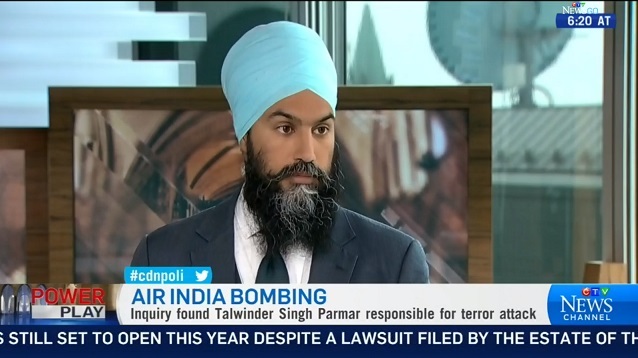 Last fall Singh wouldn’t even say Parmar was behind the bombing and attacked those that criticized him as racists. When he finally was confronted on his ongoing appearances at events glorifying Parmar and other terrorists, Singh declared that he would go to such events in the future to share his ideas of peaceful change even if others were advocating violence and armed resistance. So let that sink in for a minute and realize this is not your grandfather’s NDP anymore. Under Jagmeet Singh’s leadership, a pro-choice MP that believes the government of the day is going too far in attacking pro-lifers is disciplined for voting for a Conservative motion against the Liberals. This wasn’t an NDP motion he voted on the wrong side of, it was against the government the NDP opposes. But while Christopherson is disciplined for standing up for Charter rights, Singh will continue to attend events where terrorists are honoured and the break-up of a democratic ally through armed revolution is discussed. The NDP long ago stopped having pro-life MPs, now you can’t even say nice things about pro-lifers and their rights but terrorists, well the NDP increasingly love them. The party that used to have pacifists like J.S. Woodworth now embraces every so-called self-determination group regardless of tactics it seems. What is going on with the so called people in gov.? I contend that the NDP are, and have always been, essentially international socialists (i.e., communists). The core of socialism is collectivism and its power and control have their source in the state. Collectivism demands 100% loyalty or one is thrown out of the collective. 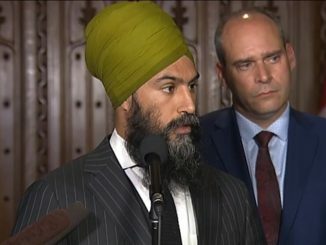 Jagmeet Singh is, therefore, behaving precisely as a collectivists behave. With the Liberal Party so far left, there is no more room for the NDP. They are going to have a hard time differentiating themselves from the Liberals, imo. I have never voted NDP. Too radically left wing socialist for me. BUT Mr. Christopherson has displayed integrity by standing up for his constituents and organizations that have served the country for decades. Based on his ethical stance, if he were my MP, I would vote for him for this alone. HOWEVER, unless the people of Canada start making noise and standing up to the totalitarian regime that is becoming more prominent each day, then it will be a sorry day when Canadians keep whining after doing nothing and not getting involved. 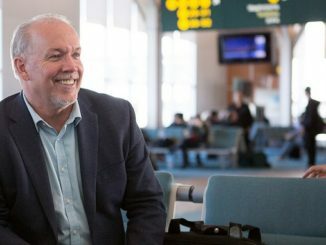 Well, looks like he’s got the main quality of an NDP leader alright: utter hypocrisy. Not “your grandfather’s NDP”? Um, yeah, it is. My grandfather’s NDP was Tommy Douglas forcing sterilization on the sub-normal. Socialists, all socialists, always have been and always will be the same. Whether they are orchestrating a famine (great leap forward, Holodomor, …), or giving $10.5 million to Khadr, or making you wait in line for a doctor while taking your guns (standing behind their 24/7 armed security).